Heat oven to 425°F. Spray cookie sheet with cooking spray; sprinkle with cornmeal. Do not unroll dough. Cut roll of dough into 4 equal pieces; shape each piece into a ball. Roll or press each ball of dough into a 5-inch round making edges slightly thicker to form a rim. Place the rounds on the prepared cookie sheet; brush each with oil. Bake 6 to 8 minutes. Top each round with 1 of the variations below. Bake 10 to 13 minutes longer or until crust is deep golden brown and cheese is melted and bubbly. Pepperoni Pizza: Spread round with 2 tablespoons pizza sauce. Mix 1/4 cup Cheddar cheese and 1/4 cup mozzarella cheese; sprinkle over pizza sauce. Top with pepperoni. 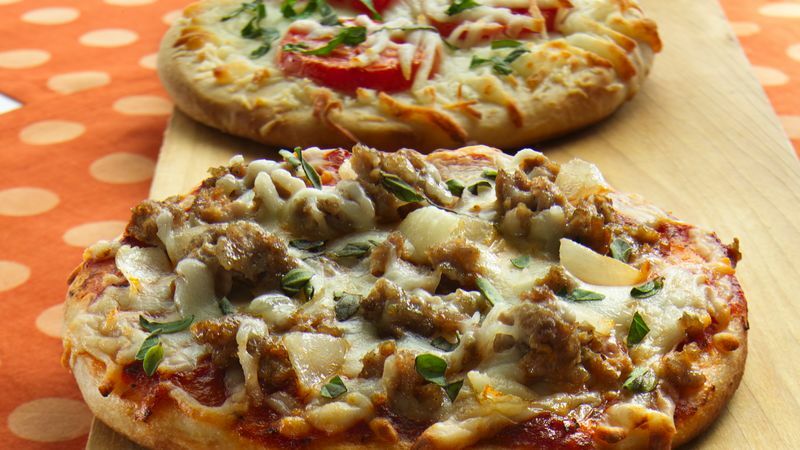 Italian Sausage Pizza: Cook sausage and onion in 8-inch skillet over medium heat, stirring frequently, just until sausage is no longer pink; drain. Spread round with 2 tablespoons pizza sauce. Sprinkle with 1/4 cup mozzarella cheese. Top with sausage and 1/4 cup mozzarella cheese. After baking, sprinkle with oregano. Margherita Pizza: Sprinkle round with Parmesan cheese and 1/4 cup shredded mozzarella cheese. Top with tomato slices and 1/4 cup shredded mozzarella cheese. After baking, sprinkle with basil strips.